Ms Ressa has been accused of “cyber-libel” over a seven-year-old report on a businessman’s alleged ties to a former judge. In particular, Rappler has published a number of reports critical of Mr Duterte’s war on drugs, which police say has killed around 5,000 people in the last three years. In December, it also reported on his public admission that he sexually assaulted a maid. 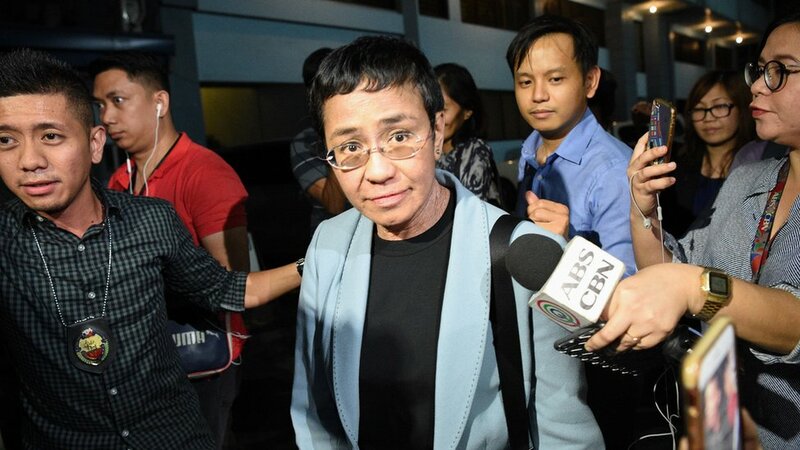 What’s the case against Maria Ressa? The charges of “cyber-libel” relate to a seven-year-old report on a businessman’s alleged ties to a former judge. This new arrest comes just two months after Ms Ressa posted bail on tax fraud charges, which she says are also “manufactured”. Activists and press freedom groups around the world have criticised the Rappler CEO’s detention. Former US Secretary of State Madeleine Albright called it an “outrageous” arrest that “must be condemned by all democratic nations”. Human rights group Amnesty International said the Duterte government was using legal threats to “relentlessly intimidate and harass” journalists. President Duterte has previously denied that charges against Maria Ressa are politically motivated, but has publically branded Rappler a “fake news outlet” and banned its staff from covering his events. Last year, the state revoked the site’s licence. In response, Rappler said it would “continue to operate as it files the necessary motions for reconsideration with the courts”. Speaking to reporters after her arrest, Ms Ressa said she was “shocked that the rule of law has been broken to a point that I can’t see it”. Footage streamed on Facebook showed plain-clothes party officials speaking with her, while several of the site’s journalists live-tweeted what was happening.